CO lines are the main tracers of various properties of molecular gas, especially in studies of high-redshift galaxies. They are important in revealing the total mass, density, temperature of the molecular gas, which serves as the most direct fuel of star formation. The observations of the CO lines thus help us better understand the star formation processes at high-redshift. In this recently published work* lead by Chentao Yang, a former PhD student of Purple Mountain Observatory, supervised by Yu Gao, Alain Omont and Alexandre Beelen, collaborating with astronomers around the world. The have conducted more than 100 hours observations using IRAM-30m telescope of different CO transition lines in a sample of strongly lensed submillimeter-bright galaxies (SMGs) at redshift around 2 to 4. Those galaxies were part of the Herschel-ATLAS sample, being a key project of Herschel surveying a whole area of sky of around 600 square degree. Fig.Distribution of the observed velocity-integrated CO line ﬂux density versus the rotational quantum number Jup for each transition, i.e. CO SLEDs. Black dots with error bars are the velocity integrated ﬂux densities from this work. Red dots are the data from other works: all CO(1–0) data are from Harris et al. (2012); CO(4–3) in G09v1.97 is from Riechers et al. (in prep. 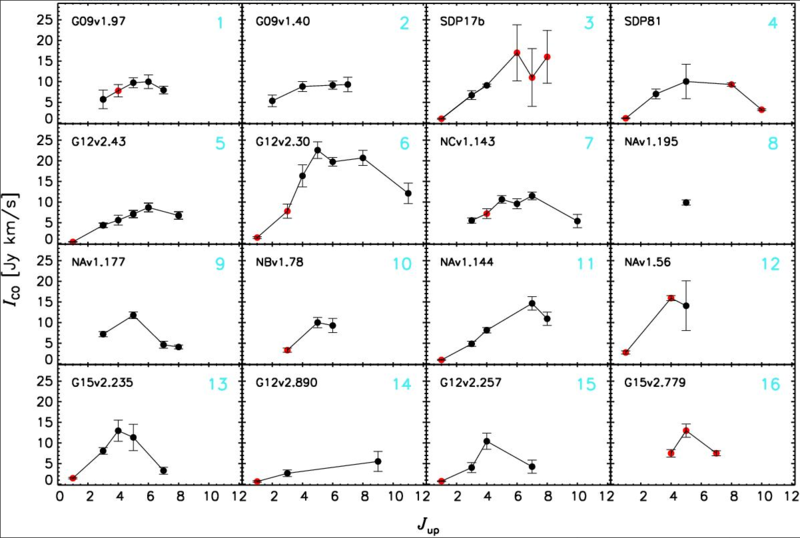 ); CO(6–5), CO(7–6) and CO(8–7) in SDP17b are from Lupu et al. (2012); CO(8–7) and CO(10−9) in SDP81 are from ALMA Partnership (2015); CO(3–2) in G12v2.30, CO(4–3) in NCv1.143 and CO(3–2)inNBv1.78arefromO13;CO(4–3)inNAv1.56isfromOteoetal.(inprep. ).Foracomparison,wealsoplottheCOSLEDofG15v2.779 (Cox et al. 2011). We mark an index number for each source in turquoise following Table3 for the convenience of discussion.